To celebrate the inauguration of the newly restored former organ of the Palais du Trocadéro and Palais de Chaillot in Paris, the Orchestre National de Lyon and their organist-in-residence, Vincent Warnier, present two major works for organ and orchestra by Camille Saint-Saëns, both of which are historically linked with the great Cavaillé-Coll organs. The composer himself conducted the French première of Cyprès et Lauriers at the Trocadéro in October 1920, entrusting the solo part to Eugène Gigout. Camille Saint-Saëns’ inclusion of organ and piano in his Symphony No.3 in C minor was unprecedented at the time. It was driven – in the composer’s words – ‘ by the progress made in modern instrumentation’. Inspired by Liszt, to whose memory the work is dedicated, it is a spectacular example of music both resplendent and grandiose. 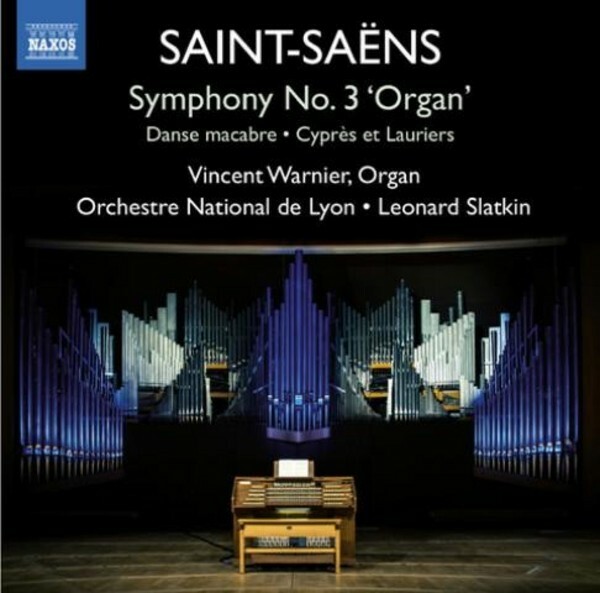 One of the most popular showpieces for organ, the Symphony No.3 is coupled here with the rare and poignant Cyprès et Lauriers and Vincent Warnier’s revision of Edwin Lamare’s arrangement of Danse macabre – another famous sonic spectacular for solo organ.